On this year’s Low-Carb Cruise, we had some very interesting table-mates for dinner, some of which I managed to talk into coming up to my cabin for a video interview (I already mentioned Christine and Jimmy Moore). 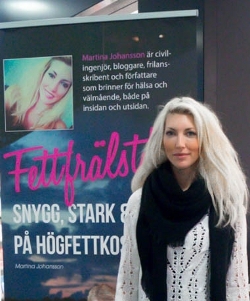 Among those was a Swedish Blogger named Martina Johansson. Martina is not only quite well known in Sweden, she has a substantial following in the U.S., even though her blog is written entirely in Swedish. (Yay for Google Translate!) After speaking at length with Martina, it’s no surprise that her blog gets substantially more hits than mine does! Martina seemed a bit shy (before she came up for the interview, she asked Jimmy if I was legit — thank you for your support, Jimmy!). Once we got started, though, she opened up and we had a really delightful chat. 18:00 Martina’s two books, High Fat Fitness & Hormone Optimization (not exact title: both books are in Swedish) — she is considering an English translation of both. This entry was posted in Diet, Fitness, Health, Low Carb Cruising!. Bookmark the permalink.